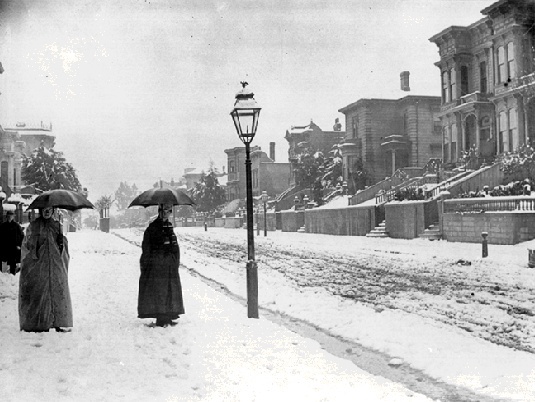 1887: over 5 inches of snow falls in San Francisco. This is the 600 block of Shotwell Street in the Mission. When San Franciscans first came to Woodward's Gardens in the late 1860s, the surrounding Mission district was still farms and ranches. But by the 1870s, the Mission turned into a rapidly growing suburban community, connected to downtown San Francisco by horse-drawn trolleys along Valencia, Mission, South Van Ness, and Folsom Streets. And real estate values rose sharply, even before many houses and shops had been built in the still largely empty neighborhood. 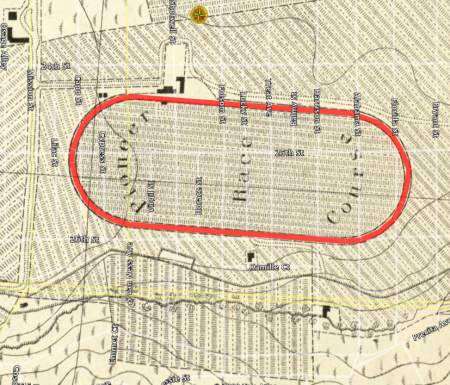 In 1859 the San Francisco Union Homestead Association purchased the Pioneer Race Track site, south of 24th Street, for $500 an acre. Just ten years later, that same land was worth $20,000 an acre. Homestead associations were instrumental in developing outlying neighborhoods like the Mission, Hayes Valley, and the Western Addition in the late nineteenth century. With their substantial capital, these associations purchased large pieces of land at "wholesale" prices then subdivided the property into single building lots. Each share of stock in the homestead association entitled the holder to one lot. Some families received their one lot and built their home on it. But builders and real estate speculators often were large shareholders in homestead associations and took title to 100 or more lots which they developed or held for still greater increases in value as the surrounding neighborhood was built up. During the late 1870s San Franciscans expected the Mission to become San Francisco's new elite neighborhood because of its sunny weather and its convenient location. And a few large houses were built in the Mission, like Judge Daniel Murphy's 1878 Italianate style home at 159 Liberty Street, near Dolores Park (then two Jewish cemeteries). But the start of cable car service on Clay Street in 1873 and on California Street in 1878 assured the society preeminence of Nob Hill, and the Mission district evolved into a socially and economically heterogeneous neighborhood. The well-to-do still built fine homes on the high ground along Guerrero and Dolores streets, near Dolores Park, and in the flats along broad South Van Ness Avenues and Folsom Street between 20th and 26th Streets. The rest of the Mission became a solidly working and middle class area, often attracting Irish and German families who were fleeing the increasingly run-down housing and growing number, of factories south of Market Street downtown. Tract developers readily accommodated the new arrivals to the Mission with block after block of well built richly-ornamented Italianate, Stick Style, and Queen Anne cottages and flats. And the price was right. Fernando Nelson, who built 4,000 houses all over San Francisco during his long contracting career, sold some cottages in the Mission during the 1880s for as little as $750. Another active developer in the Mission was The Real Estate Associates, which completed more than 1,000 houses throughout the city between 1871 and 1881. In its heyday, The Real Estate Associates employed 300 to 400 workmen, and; according to the detached company's own advertising, they built "more houses than any other person or company in the United States in a similar time span." Today, many of The Real Estate Associates houses are still standing in the Mission: at 552-558 and 571-581 Capp Street. 953-959 Valencia Street, 3320-3324 21st Street, 14-30 Hill Street, and at 320-324, 354-376, and 317-351 San Carlos Street--a total of seventeen houses on one block. By the turn of the century, the Mission District was almost solidly built up with Victorian houses and flats, except for some vacant lots near Army Street, and Mission Street was lined with neighborhood shops.